Madoff Litigation: Can the Lost Billions be Recovered? How? This webcast featuring three of the top lawyers and professionals in the securities litigation field addresses the key questions arising from Bernard Madoff's alleged $50 billion scheme: How much money has been lost? Where did it go? What avenues of possible recovery exist and what are the chances of success? Who is entitled to recover? Please join panelists Gerald Silk of Bernstein Litowitz Berger & Grossmann LLP; Brad Friedman of Milberg LLP; and Dr. Fred Dunbar of NERA Economic Consulting as they address these questions as well as your questions in a free, one-hour webcast. Moderated by Bruce Carton, Editor of Securities Docket. This webcast is sponsored by NERA Economic Consulting. 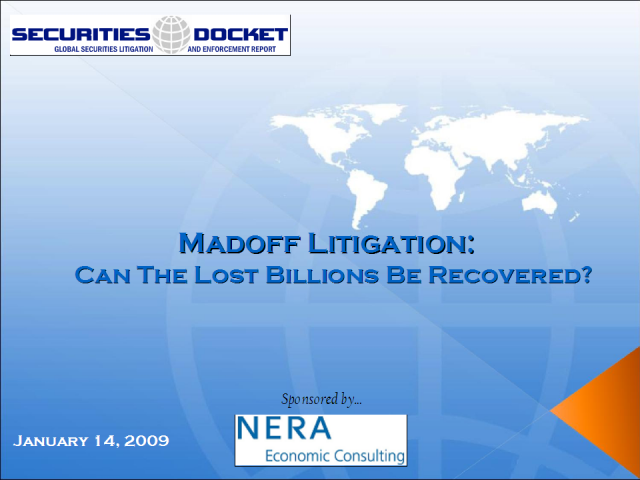 Title: Madoff Litigation: Can the Lost Billions be Recovered? How?